First, I saw the preview for the movie. Then, I decided to read the book. Finally, I saw the movie. 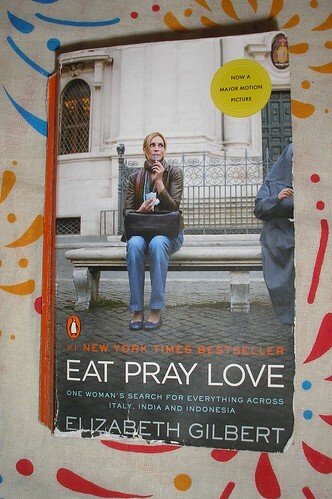 Now, I have to admit… I’m totally in awe of Elizabeth Gilbert. I want to meet her, shake her hand, and tell her she’s my hero. OK, so I can’t actually relate to her story. It’s a story of divorce – something I know nothing about. But on the other hand, I can relate to her story so much. It’s a story of breaking free from the life you think you have to live, daring to ask yourself the radical question “What do you want to do?”. It’s a story that reminds us that it’s ok to eat a whole pizza once in a while, that it’s ok to stop and think about life, and that when we stop looking for all the things we think we need, the ones we actually need find us anyway. I won’t ruin the story for those of you who haven’t read it yet. I will just say READ IT. As for the movie, watch it after you’ve read the book, and accept that it is different from the book, but allow it to carry you away on an adventure anyway. Oh, and then read “Committed”, which is a sort of sequel. If you tell me, after reading these books, that they didn’t have a profound affect on you, or that you don’t now want to travel or start something new, I won’t believe you. Trying to finish the book before the movie opens here on 24th. Really enjoying it.